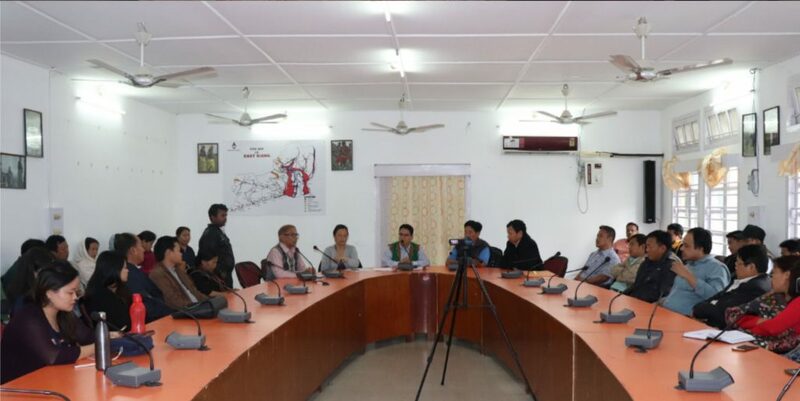 PASIGHAT, April 14, 2018: Alongwith the rest of the Country, East Siang district also celebrated Samajik Nyaya Diwas(Social Justice Day) as part of Gram Swaraj Abhiyan here today, on the birth anniversary of Bharat Ratna, Dr. B.R. Ambedkar. 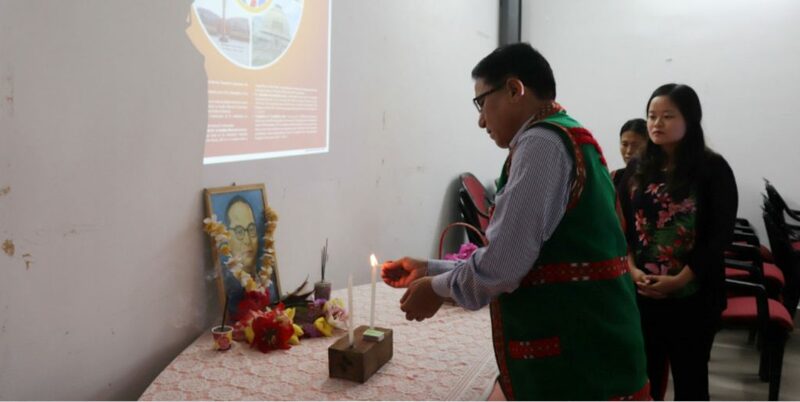 DC East Siang,Shri Tamiyo Tatak led in paying floral tribute to the portrait of Dr.B. R. Ambedkar on the occasion here at DC Conference Hall. Addressing the gathering, DC Tatak highlighted the importance of launching the Gram Swaraj Abhiyan on the Birth Anniversary of Bharat Ratna, Dr.Ambedkar , as the Architect of the Indian Constitution had dedicated his life towards the upliftment of the underprivileged sections of the society,promotion of social justice , equality and protection of the rights of citizens towards the goal of inclusive society.He urged to draw inspiration from immense contributions of Dr. Ambedkar to the Nation. He further called upon all the stakeholders and members of society, to create awareness on the welfare flagship programmes of the Government of India so that the benefits reach the targeted grassroot people in villages. Awareness about the benefits extended under the flagship programmes, should percolate to the last man in the most inaccessible area of the district,so that the objective of the Gram Swaraj Abhiyan (Village Self-Governanace) is achieved in the true sense in reaching out to the underprivileged sections of society in particular and benefits are availed by them during the 21 day outreach campaign. A short film on the life of Dr. B.R.Ambedkar was also screened on the occasion. DD(ICDS), Ponung Ering Angu also spoke on the occasion. At Yagrung Circle Hq., Circle Officer, J.Modi, ZPM Bosing I & II Namuk Taloh & Osi Tatak respectively also attended the launch of the Gram Swaraj Abhiyan at Tekang Dere(Community Hall). Shri AlenTasing and Smt. Omem Boko, Anchal Chairpersons along with Gram members,GBs, and village members attended the programme. In his address,Circle Officer, J. Modi , informed that the Gram Swaraj Abhiyan has been launched beginning today till May 5, by the Government of India to bring self-Governance in every village. The Day is observed as Social Justice Day , he further informed. Various Speakers highlighted the contribution of Dr. B.R. Ambedkar for promoting the cause of the backward and towntrodden people of the society.